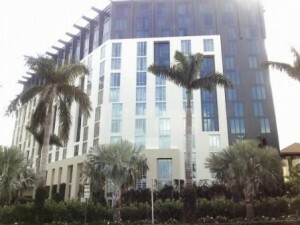 As of today, Jan. 29 2016, the much awaited WPB Hilton Convention Center Hotel is open and receiving guests. Located at 600 Okeechobee Blvd right across from CityPlace, this 12 story, 400-room hotel will offer visitors easy access to the Palm Beach County Convention Center as well as shops, restaurants and entertainment at CityPlace. Featuring eight conference rooms, two ballrooms, pool deck with cabanas, the Manor restaurant serving breakfast, lunch and dinner and the Galley bar and lounge, grab-and-go cafe, fitness center and poolside bar, this brand new Hilton Hotel will bring more people to the area and give a big boost to our local economy. The Hilton Convention Center Hotel is a great choice for annual events downtown West Palm Beach, 4th on Flagler and Sunfest are extremely popular so book your reservations accordingly.